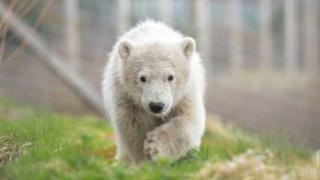 The birth of the first polar bear cub in the UK in 25 years has led visitor numbers at a Scottish zoo to almost double. Hamish, who will be a year old next week, shares an enclosure at the Highland Wildlife Park with his mother, Victoria. The park at Kincraig, near Aviemore, had its 200,000th visit of 2018 at the weekend. The previous best year for visitor numbers was 2016 with 136,704 visits. Last year, 122,538 people visited the park. Head of operations and visitor services, Daska Mackintosh, said the new record figure was a "phenomenal milestone". The park's cub, who first went on public show in March, was called Hamish after a public vote for a name. The cub's father, Arktos, is kept in another enclosure along with another adult male polar bear called Walker. How do you keep a polar bear cub cool in 30C heat?